Written procedures should detail the means for establishing that piping and equipment are "fit for maintenance". Normally, the procedures should include: stop/isolate the process flow through the equipment, vent/drain the system, test for hydrogen, then declare the equipment fit for maintenance. Make sure the design has adequate test points and that the equipment is free of hydrogen before opening a flange or coupling (e.g., do bleeds on both sides of a control valve). OSHA standard 1910.147 applies to the control of hazardous energy sources during equipment maintenance. Employers are required to establish a program and utilize procedures for affixing appropriate lockout or tagout devices to energy isolating devices, and to otherwise disable equipment to prevent unexpected energization, startup, or release of stored energy to prevent injuries to employees. 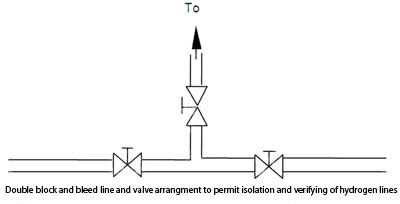 Similarly, lockout/tagout procedures should also be used to isolate electric power sources and pressure vessels prior to maintenance activities in their vicinity. All personnel should be trained on proper procedures for taking hydrogen systems offline (and for bringing the systems back online). Maintenance that could lead to a release of hydrogen should be avoided by first removing the hydrogen from the system. Inert gas subsystems are used to provide purge and pressurization gases, to ensure that all hydrogen-containing volumes are capable of being purged, and to ensure that purge gas is vented. The inert gas subsystem is protected from hydrogen contamination by maintaining the subsystem at higher pressure and using check valves and/or a double block and bleed arrangement. Flowing gas purge: An inert gas, typically nitrogen or helium, flows into one part of the system and out of another part of the system. Considerations include the volume to be purged, gas flow rate, regions of poor flow (voids or dead ends), and the duration of the purge. Rapid or turbulent flow such that all parts of the system are thoroughly purged is desired. Depending on the flow path geometry of the volume to be purged, this technique may be least likely to ensure a positively purged system. Pressurizing-venting cycle purge: Alternate pressurizing and venting is used to successively dilute the contents of a volume until the desired mixture concentration is obtained. A greater internal pressure is maintained during venting to prevent the backflow of air. Analysis of residual gas, by measurement or calculation, is necessary to determine the completeness of the purge. This approach may require greater use of purge gas resources that other approaches. Vacuum purging: The system is vented to atmospheric pressure, then pumped to a relatively low pressure (pump limits are typically 1.3 kPa (10 torr) for a mechanical pump), re-pressurized with the desired gas to a positive pressure, and then vented to atmospheric pressure. The system being pumped must be capable of maintaining structural integrity (not collapsing) and preventing in leakage during pumping. In cryogenic systems, selection of purge gas must take into consideration the system temperature. Helium is acceptable at liquid hydrogen temperatures. Nitrogen use is only appropriate for system temperatures above 90 K.
One should always assume that hydrogen is present and verify that the system has been purged to the appropriate level when performing maintenance on a hydrogen system. Likewise, one should always assume that air is present and verify that the system has been purged to the appropriate level when reintroducing hydrogen into a system. OSHA standard 1910.147, The control of hazardous energy (lockout/tagout) can be purchased online.